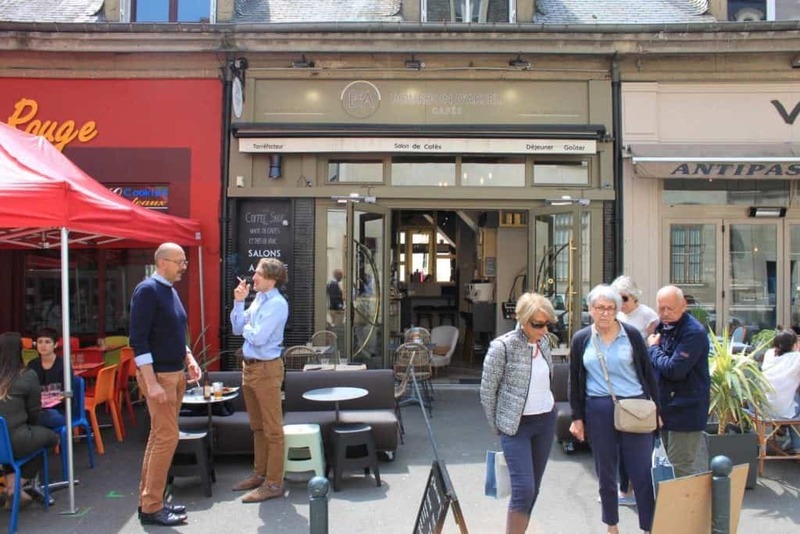 Bretagne (Brittany), the region located in the northwesternmost part of France, is finally seeing its cities opening speciality cafés. The region that is known for its gastronomy, especially crêpes and salted butter, only saw most of its speciality cafés open in the last 12 months! Having spent most of my childhood and my first years of university studies in the region, I am very happy to see all these places opening and serving speciality coffee. Five years ago, finding a place that served it was unthinkable. Today, it seems that the cafés do a lot in order to change the coffee-drinking habits of the locals. And since Bretagne is also a very popular touristic destination made for road trips, attracting millions of tourists mainly from the United Kingdom and Germany every year, those new places can only be a pleasant surprise for them. Café 1802 opened in Rennes in November 2017. Located in an old half-timbered house with granite stone walls, wooden beams and low-height ceilings, this typical Breton house welcomes visitors with a cozy, homey atmosphere. 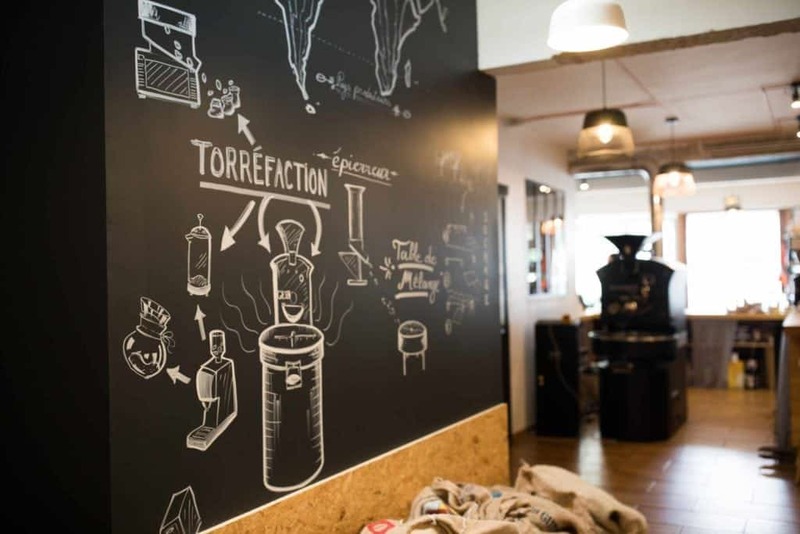 Owned by Frederic Sauvaget and Renaud Le Duc, two friends who met in high-school, their café—and today also a roastery—brought speciality coffee to the capital of Bretagne. Renaud fell into the coffee world during his time in Peru, where he lived for a couple of years. Today, he mostly cares about the roasting process, while Frederic is more focused on the extraction and the activity behind the bar. 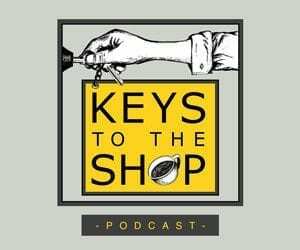 Their approach on educating locals towards speciality coffee is quite interesting. Renaud and Frederic have learned that the majority of people in Rennes cannot tell the difference between commodity and speciality coffee yet. The discussion with a customer usually comes on their second visit to the café then. In such case, the customer has already found something special about his time there, and the owners then explain a little bit more about their way of doing things. One fact to notice is that most French simply ask for a “café” or for a “café crème”, over-extracted, watery and bitter drinks of larger quantity, the later with a bit of a milky foam on top. 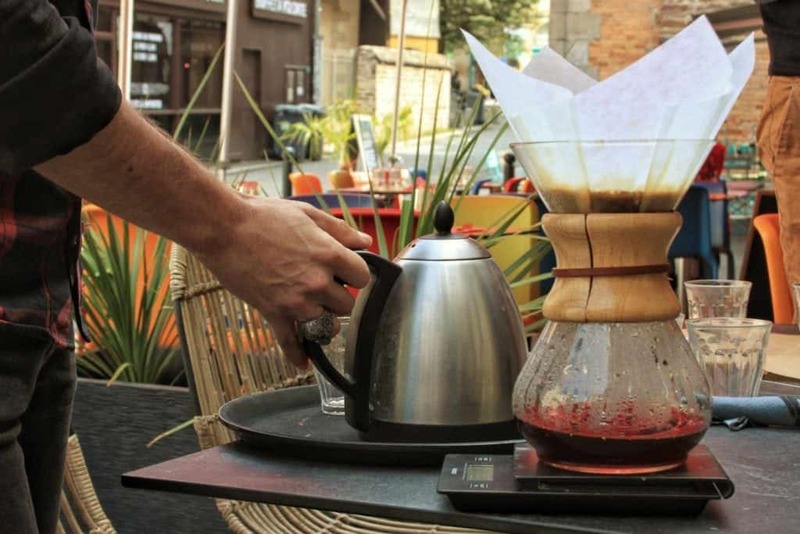 In order to bridge the gap between these drinks and new ways of coffee brewing, the owners are offering V60 brews for 2 euros, giving the newcomers a chance to try something they have never heard of. During my visit at Café 1802, I had the opportunity to try a Flat White, prepared with a blend of Peruvian Chanchamayo, a washed Caturra, and Brazilian semi-washed Daterra Minas Gerais. Café 1802 roasts their coffees on a Giesen W15 and, in the shop, prepares their coffee drinks on a La Marzocco La Strada. 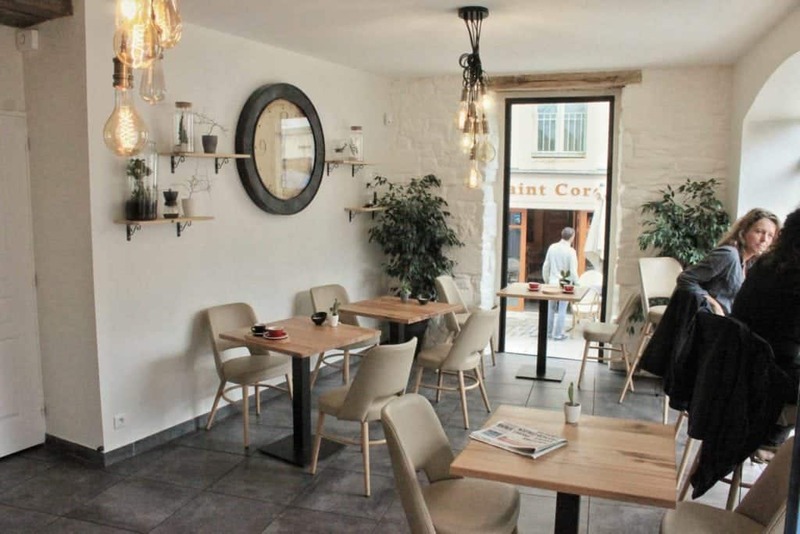 Bourbon d’Arsel opened in December 2017 on a small street in central Rennes. Two friends, Benoit Le Bigot and Sebastien Dufils, roast their beans right at the café. If you come on a Tuesday, you can enjoy the smell of freshly roasted coffee coming from their Probat roaster. Usually, the aroma can be picked up already on the nearby Rue d’Orleans. 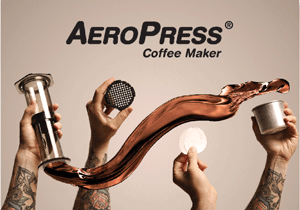 Bourbon d’Arsel offers most of the brewing methods for filter coffees, and the espresso drinks are prepared on a Victoria Arduino Black Eagle machine. During my stay there, I got a Chemex which was prepared by the barista Yoann straight at my table, in order to explain to me the story of the coffee, a Salvador Ilamatepec, 80% washed, 20% natural. As a souvenir of the experience at Bourbon d’Arsel, a small card with the information about their coffee is offered to the customers. Another card explains the origins of the name “Bourbon d’Arsel”. The island of Bourbon (nowadays Reunion, a French territory in the Indian Ocean) was where Guillaume Dufresne d’Arsel, a Breton vessel captain, travelled to with 20 coffee plants from Yemen in 1715. 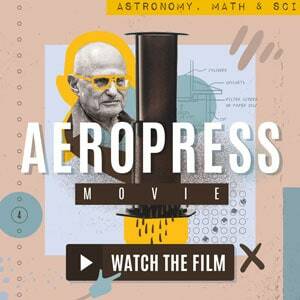 His goal was to start producing coffee in French territories, upon the request of Louis XIV, former French king. The design of Bourbon d’Arsel is also one of the main assets of the place. Bourbon d’Arsel is a true “salon de café à la française”, a classy, Parisian-looking bar. In addition, the place doesn’t serve the traditional coffee shop sweets and snacks, such as cheesecake or brownies, but stresses to be a real “French bistro”, offering local cuisine for lunch, such as quiches and pies, local salads, and a great selection of desserts. 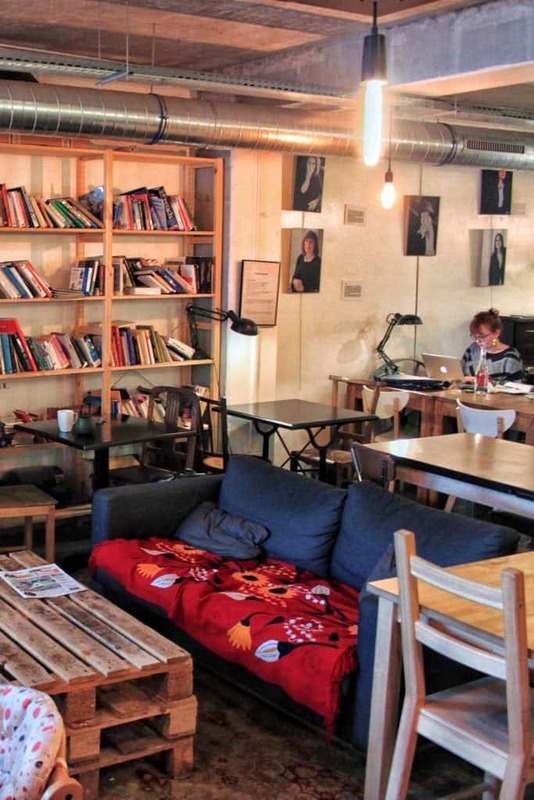 BEAJ Kafe is probably one of the first places offering speciality coffee in Bretagne. 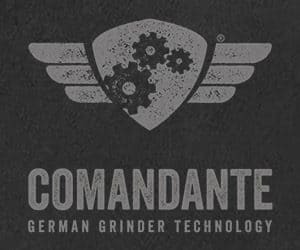 Located in Brest, it was opened in December 2014 by Romain Guerizec, with support from his family, since prior to his business venture, he had spent many years abroad as a student, in Australia, Argentina and Berlin. During his studies, Romain hung out at cafés a lot, chilling with his friends or studying. He realized that Brest, a city with 25 000 students, doesn’t offer such place. Brest, one of the cities with the most rainfalls, really needed to offer its students an indoor place to spend time together besides home, pubs and the university library. Romain realized that opening a café is not a simple task though, and therefore, went for a training at La Caféotheque in Paris. There, he met with people who helped him build an expertise in speciality coffee. To learn about roasting, he went to Belco in Bordeaux. Today, Romain roasts his own coffee in the shop with his 6kg Giessen and supplies green beans from Belco. He also got some coffees delivered from the Dominican Republic by TOWT (Trans Oceanic Wind Transport), who bring coffees to Europe by boat, in order to reduce CO2 emissions. Another origin where Romain gets coffee from is India. The name of the café, BEAJ, fits the spirit of the place perfectly. It means “journey” in Breton language. Local products as well as coffee from different continents meet here, and the local crowd meets the few foreigners living in Brest. As I could see during my visit there, BEAJ KAFE became more than a coffee shop, it is truly a living place, waking up early morning for breakfast lovers, welcoming people all day long, and offering evening entertainment. 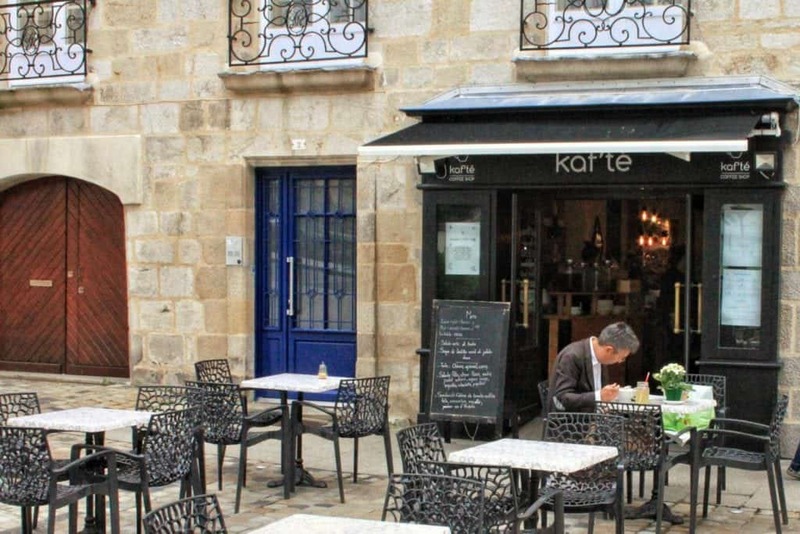 Kafeenn opened in Quimper in May 2017, in Place au Beurre (Butter Square), the city’s most known square, among numerous Breton-pancake restaurants. Gauthier Le Guen, one of the owners of the café, jokes about it, as it happens quite frequently that tourists take a seat at his terrace, asking for some crêpes to eat. Gauthier opened Kafeenn with his friend from high-school, Florian, with whom he shared a background in the HoReCa industry. 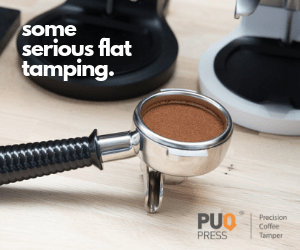 They discovered speciality coffee during their travels around the world and especially liked the multicultural aspect of those cafés using beans from various continents. This is also something that applied to the cafés’ customers. Kafeenn means coffee tree in the Breton language, so Gauthier and Florian, who are nature lovers, named the cafe after it, to show the connection between both the coffee and the nature.The name is also very close to the way that foreigners pronounce the word ‘caffeine’. Kafeenn is a minimalist looking café offering a menu of all the traditional espresso drinks and brew methods, with the addition of many seasonal signature drinks, such as Black Latte prepared with vegetable charcoal and acacia honey. 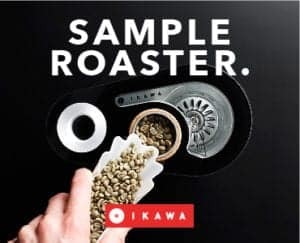 They work in collaboration with Mokxa, a roastery in Lyon, and get a selection of beans from Brazil, Guatemala, Ethiopia and Peru. I got the chance to try a Flat White, prepared with a blend of Brazil and Guatemala, with milk chocolate and lime notes, brewed on a Victoria Arduino White Eagle. Although Flat White’s aren’t the most popular drink yet, Kafeenn finds the way to the heart of their customers with cappuccinos and … hot chocolates. The teenagers from the nearby high-school come to study here before their exam period, and Gauthier and Florian are happy with it. 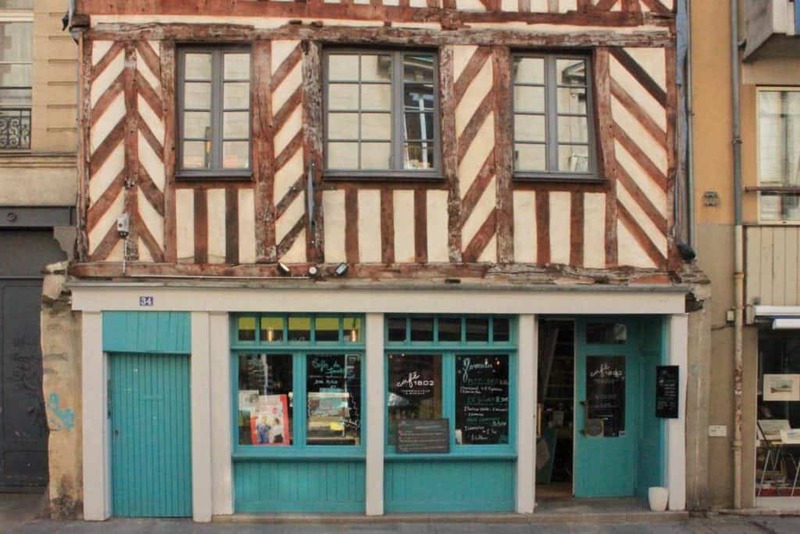 Gauthier explained why: ”This local crowd will get older, and become coffee drinkers anytime soon.” It is an easy way for them to target not only tourists visiting the medieval town of Quimper. 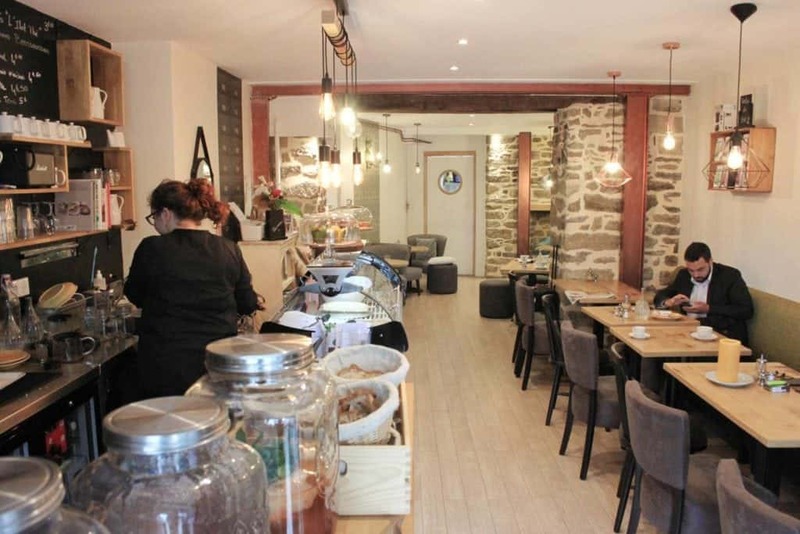 Kaf’Té, owned by Solène Blanchard, is the other place in central Quimper that opened in Spring 2017. Solène, who spent years working in the HoReCa industry, was looking for training which could be beneficial to her entrepreneurial career. Solène got to appreciate coffee thanks to the Coutume team in Paris when she attended a training purely by coincidence. The first coffee she tried at the training was a V60 and she understood how to appreciate coffee and how valuable this product could be. This experience helped her to define what added value she could bring to her business and to the people in the city she lives in. Kaf’Té was born. 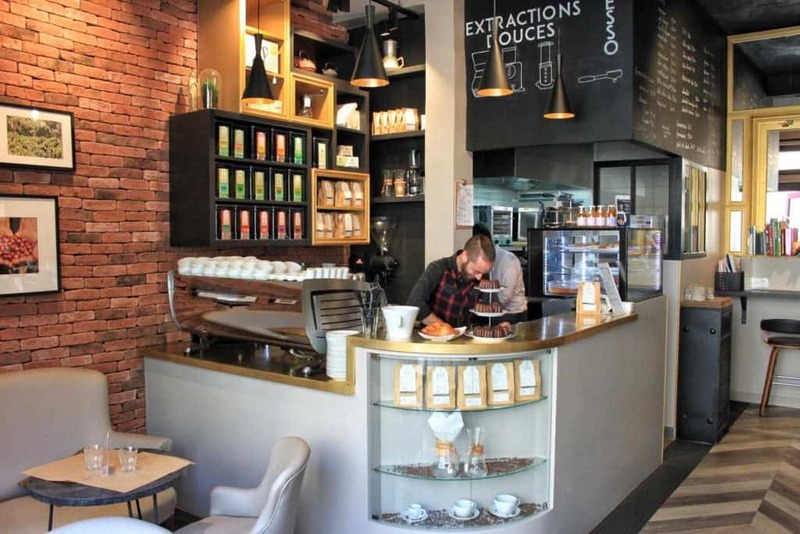 Kaf’Té offers a range of beans from Coutume and the drinks are prepared by Solène and her colleague Emelyne on a La Marzocco Linea Classic, but they do not serve hand brews yet. 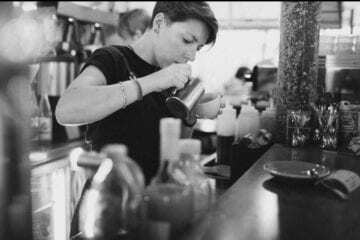 Since the single espresso is the most requested drink by their customers, Solène, who admits to still have a lot to learn about coffee, considers keeping this a strong focus as a key to success. Kaf’Té also offers brunch and lunch, with a different menu every day, which is a great way to attract many locals and give them the first encounter with speciality coffee. For the future, Solène even plans to open a second shop. 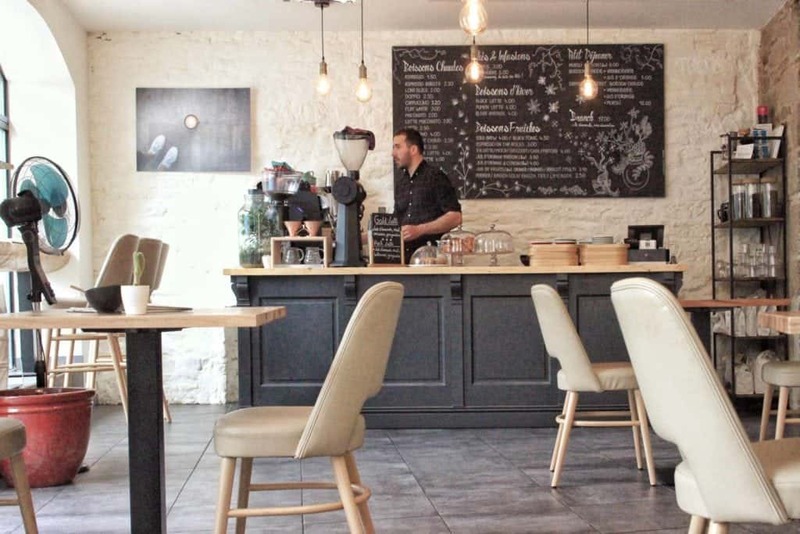 Located in the small town of Auray, in South Bretagne, Le Café qui Fume (The smoking coffee), a café and roastery, was opened in 2016 by Nolwenn and her husband, Julien. Julien takes care mostly of the roasting process while Nolwenn is behind the bar. Le Café qui Fume also operates as a restaurant, a delicatessen shop and a tea house. I suggest you to try their brunch, which on the weekends attracts people who live as far as 50 km away. You can also go for a “Koala”, their signature drink made of a double espresso and some slightly foamed hot chocolate. The roasting is done on a 6kg Giesen, and the beans come from different regions, keeping in mind that Julien buys green beans with a score of 84 to 100 points. 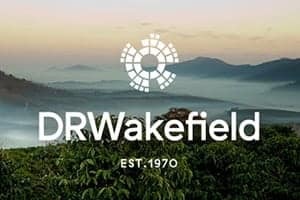 During my visit I tried a V60 prepared with a washed Colombia Planadas, and spent some time with both Nolwenn and Julien who shared with me their story as speciality coffee professionals. They were inspired by their cousin, Joel, the owner of BaseCampDoorCounty, a café in Wisconsin, US. 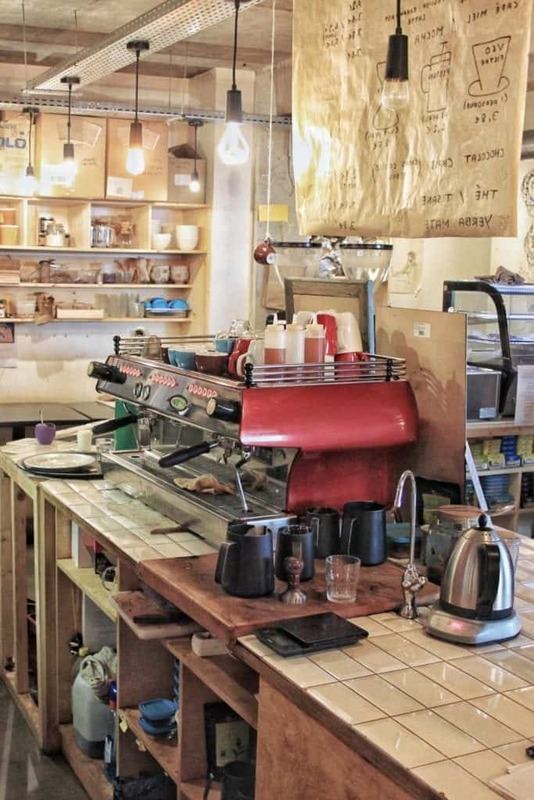 Another great influence was also the guys at Workshop Coffee in London, UK. 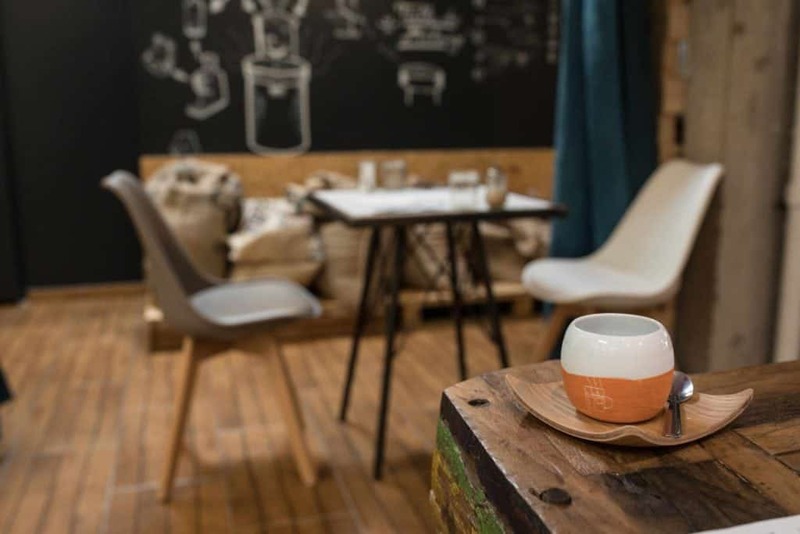 La Café qui Fume now provides training for other people willing to start a career in the coffee industry, and they also work as a distributor for many coffee brands in the region. 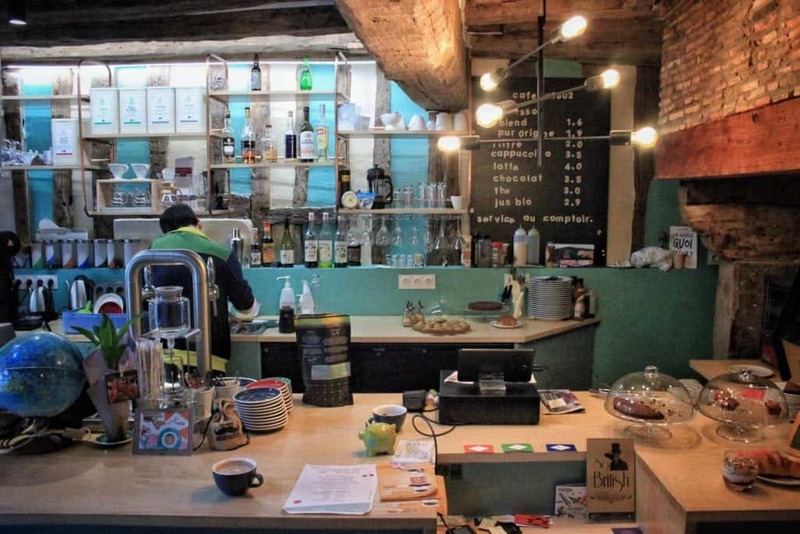 They sell their coffee to other places in Bretagne willing to offer more than commodity coffee to their customers, such as Edd Hostel in Dol-de-Bretagne, Le café des Orfèvres in Vannes, or Fika in Saint-Brieuc. Le Café qui Fume also provides coffee beans for regional competitions. Luka Zivkovic is a passionate traveller who discovered speciality coffee in Northern Germany and Estonia. Now settled in Romania, his interests include traveling, photography or geopolitics.